Do you have trouble going to bed at night when there’s a mess in the kitchen? Do you think you would be happier if only you could lose weight, be a better parent, work smarter, reduce stress, exercise more, and make better decisions? You’re not perfect. But guess what? You don’t have to be. All of us struggle with high expectations from time to time. But for many women, the worries can become debilitating–and often, we don’t even know we’re letting unrealistic expectations color our thinking. 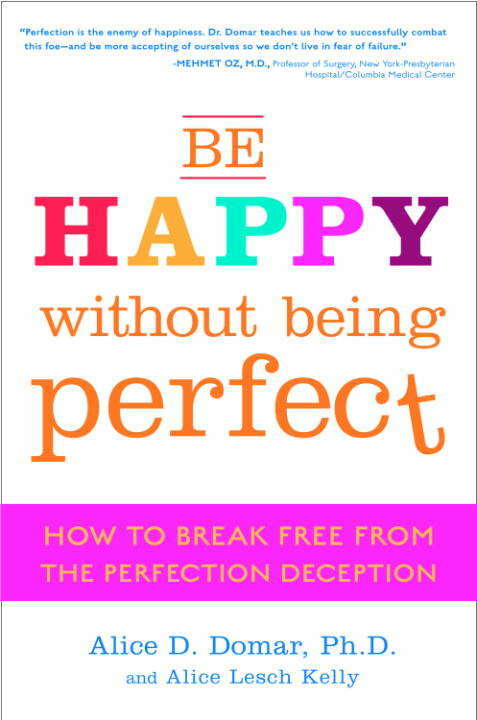 The good news is, we have the power to break free from the perfectionist trap–and internationally renowned health psychologist, Dr. Alice Domar can show you how. Be Happy Without Being Perfectoffers a way out of the self-imposed handcuffs that this thinking brings, providing concrete solutions, practical advice, and action plans that teach you how to: • Assess your tendency toward perfectionism in all areas of your life • Set realistic goals • Alleviate the guilt and shame that perfectionism can trigger • Manage your anxiety with clinically proven self-care strategies • Get rid of the unrealistic and damaging expectations that are hurting you–for good! Filled with the personal insights of more than fifty women,Be Happy Without Being Perfectis your key to a happier, calmer, and more enjoyable life. From the Hardcover edition.